"...one of our finest singers, regardless of category," Clive Davis, Sunday Times On her new album Jacqui presents a selection of lush, atmospheric orchestral arrangements in collaboration with (and lovingly dedicated to) her father, the late Sir John Dankworth. In addition to standards such as A Nightingale Sang In Berkeley Square and Blame It On My Youth, the album contains some wonderful original material in the form of the hauntingly beautiful title track (music by John Dankworth, lyrics by Buddy Kaye), and The Man, a father and daughter co-write. Now regarded as one of the country's premier jazz voices, Jacqui's early work caught the ear of Sir Michael Parkinson and national acclaim soon followed. Subsequent releases, both under her own name and with artists like the Brodsky Quartet, Courtney Pine, Tim Garland and many others, firmly secured her place at the forefront of the UK music scene. Musician and songwriter Rod Argent says in his liner notes for the album that Jacqui's "is a voice made to sing standards...clear as a bell, with wonderful intonation." 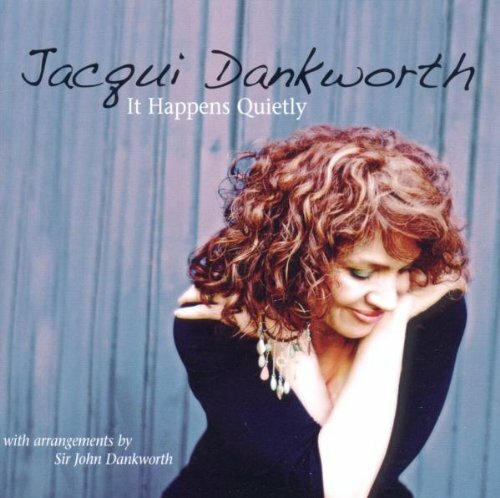 Recalling a time when Jacqui sang with her father at a local concert, Argent writes that "his beautifully structured arrangement allied to Jacqui's wonderfully moving and incisive voice had an effect on me which I'll never forget." Johnny Dankworth was perhaps the UK's best known and best loved jazz musician. His death, at the age of 82 in February 2010, was a huge blow to music lovers both at home and abroad. As well as being an iconic, world-renowned composer and arranger, he was also a prolific performer who played on hundreds of recordings throughout the course of his long and distinguished career. In an entirely unplanned but magically appropriate turn of fate, the alto sax solo from an instrumental version of The Man which John had recorded several years earlier fitted the key and tempo of Jacqui's recent studio recording perfectly, without the benefit of a click track, pitch shifting, or any other technological trickery. So this album also constitutes Sir John Dankworth's last performance on record – a fact that would have surprised even John himself!